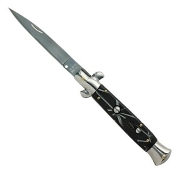 Classic Italian design switchblade knife which is one of the most recognizable automatic knives. This version has a 3.75" stiletto spear tip blade and includes an improved lock to prevent accidental openings. Strong springs ensure that this switchblade knife opens in a "snap". Includes FREE nylon belt case.